With the recent CBD oil craze, there are a number of companies who have popped up, eager to make their mark on the industry. With the legalization of cannabis in many different U.S. states, the CBD oil craze has now turned into a phenomenon and claims to be able to help with a myriad of different health issues, from back pain to anxiety, insomnia, and even depression. While more companies mean more choice for the consumer, it doesn’t necessarily mean more quality and more people you can trust. Let’s take a look at one of these companies and determine whether they’re worth your time. If you’re someone who is experienced with taking CBD and hemp oil, then you’ll know that just by itself it can be pretty dull. After all, as a pure oil, it’s not going to taste particularly exciting. 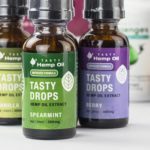 Tasty Hemp Oil, as you may have guessed by the name, has found a pretty specific niche that is going to pique the interest of a lot of people. Not only do they specialize in CBD oil products through vape oil and drops, but they also work to make these products tasty, too. You’ll find that Tasty Hemp Oil products range in price from as little as $25 to as much as $230. They’re pretty successful in the online world of CBD oil, with many different retailers both online and in-store stocking their items. However, just because a company has done well for itself doesn’t mean that they’ve been thorough – especially when it comes to their due diligence. Whether you’re on their website or taking a look at their products through a retailer, you’ll be hard-pressed to find more than a small amount of information about them. In fact, when we visited their website, we couldn’t even find an ‘about us’ page. Additionally, they haven’t bothered to include any details about where they source their CBD oil from – a pretty essential part of the process when it comes to selling products like this. This means that we are still pretty in the dark about who they are as a company, where their products are sourced and what safety measures they take to make sure that their product is up to par with the industry standards. Because Tasty Hemp Oil doesn’t publish any current or existing details about their products and where they source them from, there’s no way that we can be sure of the quality. As well as being slack in this area, they also have left out any lab testing or Certificates of Analysis that they may have gotten along the way. We understand that paperwork can be boring at times, but it’s a pretty vital part of running a health business – you’ve got to have your credentials lined up and verified. Because Tasty Hemp Oil can’t even open up about who’s the team behind the name or how they started selling CBD and hemp oil products, we don’t consider them to be too transparent. It’s hard to put your faith in a company that isn’t prepared to share even the most basic details with you. At this point, it’s probably best for you to look elsewhere for CBD oil – and make sure that they can tell you where it’s sourced.